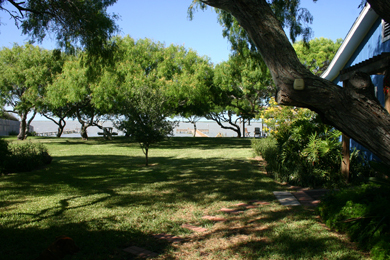 As you walk from the Great Blue Heron House towards the water and fishing pier, the calming sea breezes and the shade from the mesquite trees provide a respite from the hot summer sun. 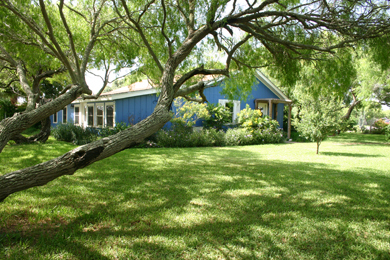 The Inn's gardens, landscaped with native and adapted plants, add beauty to Birds of Paradise Inn. Come and enjoy the 300' long, fishing pier, with cleaning station, two 300 watt lights for night fishing and comfortable bench seating. You do not have to fish to enjoy being out on the pier, seeing the fish and birds and feeling the cool breezes. The Great Blue Heron House is the newest addition to Birds of Paradise Inn. The Heron House has 3 bedrooms, 2 living areas, and 2 baths. Located closet to the Bay, there is a fantastic view of the water, pier, and birds from the house. The house has central air and heat, ceiling fans, free wireless Internet, satellite HD TV with sports package and it also has a fully stocked kitchen with a dishwasher. Birds of Paradise Inn Triplex includes two 2-bedroom apartments and one 1-bedroom suite. Each apartment has a private entrance and large porch. The Hummingbird, 1-bedroom apartment (aka the "Hummer"), shown above, has a large porch which is perfect for watching sunsets. Birds of Paradise Inn Triplex includes two 2-bedroom apartments and one 1-bedroom apartment. Above shows the entries and porches of the Green Jay and Great Kiskadee 2-bedroom apartments. Each apartment is self contained, has a private entrance and large porch. Inside you will find vaulted ceilings, ceiling fans, central air and heat, satellite HD TV with sports packages, free wireless Internet, and full kitchens. Interior doors, when unlocked and opened, can link one suite to another, creating a huge house with living rooms and bedrooms for families and larger groups. Birds of Paradise Inn is excited to be in our fourth year, providing high quality accommodations and tranquil surroundings for visitors to Kingsville, Kleberg County and Baffin Bay. Birds of Paradise Inn is small with three spacious apartments and the Blue Heron 3-Bedroom House, which helps to maintain the peaceful and relaxing atmosphere that makes the Inn special. Check out the photos of the Great Blue Heron House. Make plans to bring family and friends to Baffin Bay! Reconnect with family and friends; plan a week or a long weekend together. If you are visiting Kingsville, Texas A&M University Kingsville, the Naval Air Station at Kingsville, or visiting with family or friends living in the Kingsville area, turn your visit into an exciting and relaxing vacation! A trip to the Texas Gulf Coast, Baffin Bay and Birds of Paradise Inn is a perfect way to share the wonders and beauty of south Texas. 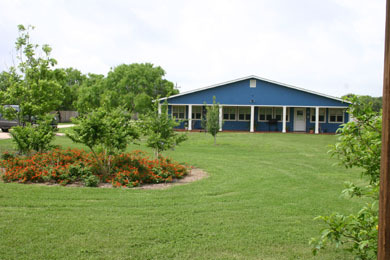 While located on the shores of Baffin Bay, Birds of Paradise Inn is only a short drive to Texas A&M University Kingsville, the Naval Air Station Kingsville, the King Ranch in Kingsville and Sea Wind RV Park at the Kaufer-Hubert Memorial Park on Baffin Bay. Located on the shores of Baffin Bay, Birds of Paradise Inn is a fantastic location for family gatherings or other special occasions such as weddings and graduation celebrations. It is also a great place to call "home" when a temporary work assignment brings you to the area around Kingsville, Kleberg and Kennedy Counties, and Baffin Bay. 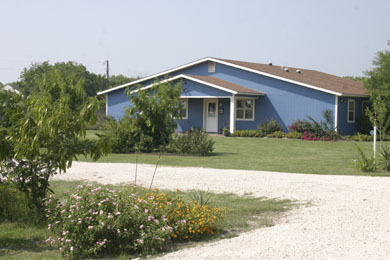 Located only 8 miles south, then 9 miles east of Kingsville, it is a short drive to town. 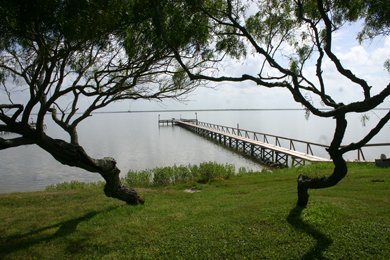 Baffin Bay, a very large, but shallow, body of water, is located between the Gulf of Mexico, Padre Island, the King, Kennedy and Armstrong Ranches and a small peninsula of farming and ranch land; Birds of Paradise Inn is located on this small peninsula. Baffin Bay is known for fantastic fishing and bird watching. The Inn is located about 50 minutes south of Corpus Christi, Texas, about 20 minutes south of Kingsville, Texas and 90 minutes north of Brownsville, Texas. "Paradise Found on the Shore of Baffin Bay", is how the Kingsville Record's Lone Star Report describes Birds of Paradise Inn. The Report also says Birds of Paradise Inn "creates a serene peaceful atmosphere reflecting a new lodging experience on the South Texas Gulf Coast". The Inn's accommodations offer a "home away from home" with living rooms, dining rooms, complete kitchens, and large porches or a gazebo. The recently remodeled Great Blue Heron 3-Bedroom House and the Triplex, containing the three apartments, have individually controlled central air conditioning and heat, free wireless Internet and satellite HD TV with sports package. Birds of Paradise Inn is small, intimate, and private; a boutique hotel without boutique hotel prices. Guests have a private, lighted fishing pier with fish cleaning station and comfortable seating, as well as picnic tables and barbecue grills. Boat parking (with water nearby for rinsing your boat) is also available. This part of Texas, also known as the Wild Horse Desert, is diverse in vegetation, wildlife and birds. It is a primary migration route for birds heading north in the spring and south in the fall. Located on the Great Texas Coastal Birding Trail's, Central Texas Coast, Kingsville Loop, birds, especially shore birds, are numerous and depending on the time of year, hundreds of varieties of birds can be found on the Inn property or within a few miles. While there is a lot to see and do in the immediate area, take the time to visit Kingsville and the King Ranch. We are also close to Texas A&M University Kingsville and the Naval Air Station Kingsville. Take advantage of our centralized location to visit other areas of the upper Texas coast, the coastal bend of the Texas coast and south Texas as Birds of Paradise Inn is conveniently located for day trips. Corpus Christi and Port Aransas, a winter home of whooping cranes, are to the north. To the north-west are San Antonio and the Texas Hill Country. To the south, a 1 1/2 to 2 hour drive will bring you to South Padre Island or the numerous Texas Wild Birding Centers in the Texas Rio Grande Valley. Come and enjoy a walk on the beach or salt flats at sunrise. Sit outside in the gazebo and listen to the surf wash against the shore as the sun comes up over the horizon then head out for some of the best fishing and bird watching in Texas. After a day of boating, hiking, fishing, bird watching, site seeing or just spending the day sitting and enjoying the quiet beauty of Baffin Bay, settle down with a drink in hand and watch the sun set on the horizon. As you relax, watch the vast sky turn from bright blue to salmon, grey-blue and gold as birds circle overhead, searching for a nightly resting place. Sub-tropical breezes will bring a feeling of peace before turning in for the night. Please come and celebrate Paradise! Local businesses, if you would like to be added to our web site, please contact us by e-mail: info@birdsofparadiseinn.com or phone 361-297-5145.